And Drop Dead Gorgeous? It's drop-dead hilarious. 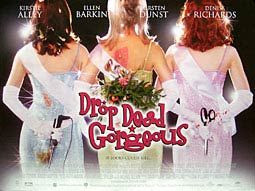 Starring a veritable murderer's row of up-and-coming movie stars (Kristen Dunst, Denise Richards, Brittany Murphy, and Amy Adams) alongside longtime comedy heavy hitters (Alley, Ellen Barkin, and Allison Janney), Drop Dead Gorgeous tells the tale of a small -town beauty pageant that turns into a bloodbath. It's a mockumentary from a time before mockumentaries were hip, in the grand tradition of the King of Mockumentaries, Christopher Guest. The mockumentary format allows a simple story to be told even simpler, with Modern Family-style jokes told directly to camera. In this case, though, there's an actual reason for a documentary crew to be there, and they don't seem to show up when needed and disappear when inconvenient, as they do in modern mockumentary comedies. Janney takes home the prize for best performance as Kirsten Dunst's caustic aunt, but both Alley and Richards do unexpectedly great work as co-antagonists. As over-the-top as the performances and story are, this is a tale grounded in real pathos, and anyone who's ever thought of killing that snotty classmate (or co-worker) that seems to get everything they want will understand exactly what's going on with these girls. A laugh-out-loud (but also very apt) story of teen angst, drama, and competition, Drop Dead Gorgeous should be the next comedy in your queue, if only for the jaw-dropping scene during which Denise Richards shows off her talent.